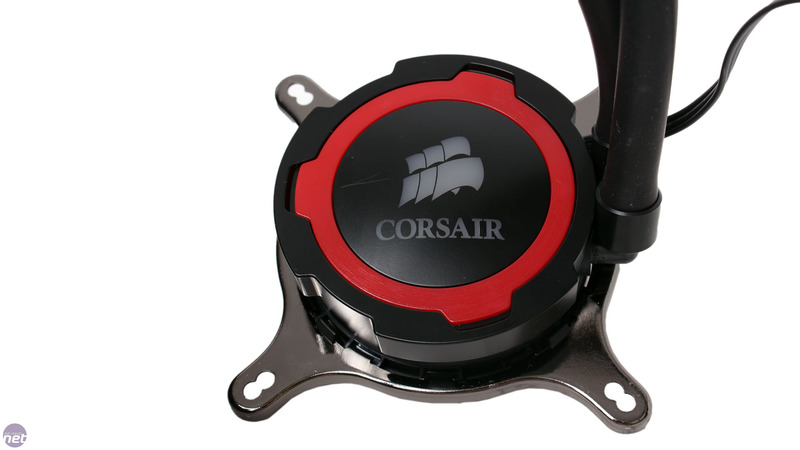 The Corsair H105 is the company's third double radiator all-in-one water-cooler in its current lineup. 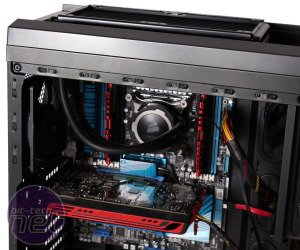 Not only that, but its £88 price tag means it also costs essentially the same as both the H100i and the H110. 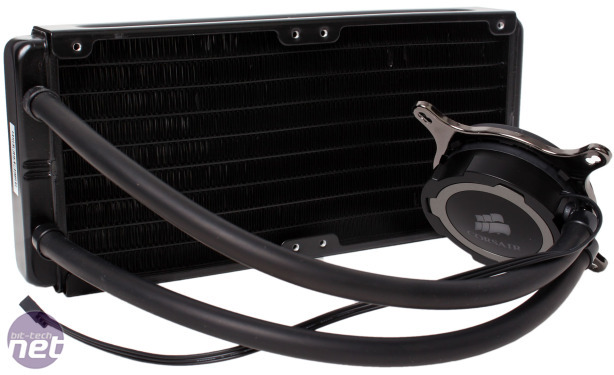 Whereas the latter differs itself by using a 280mm radiator, the new H105 sticks to a 240mm design like the H100i. 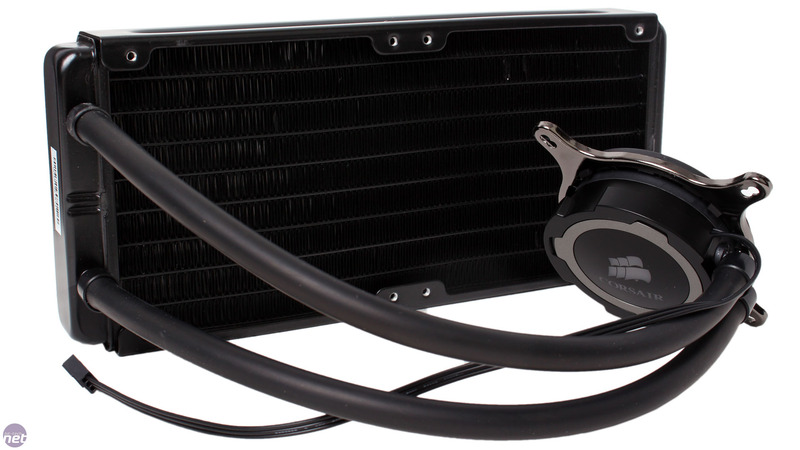 However, the radiator is thicker (38mm compared to 27mm), which should give it additional cooling headroom. 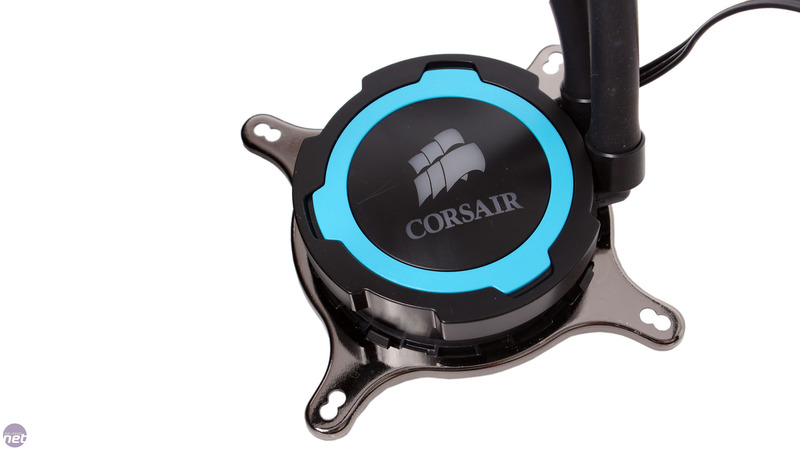 The lack of an -i suffix in the name also tells us that the H105 is incompatible with Corsair's hardware monitoring and control software, Corsair Link. 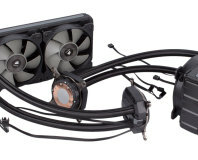 Like the H100i, the cooler is still supplied with two SP120L fans, which feature seven sharply angled blades, but these connect directly to the motherboard via 4-pin PWM headers rather than to the pump unit. 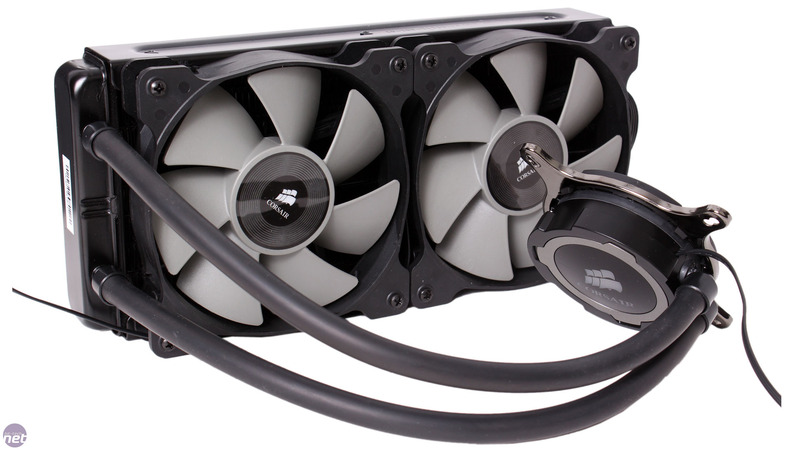 A Y-splitter cable is also provided so you can control both fans from one header. The circular pump unit is relatively low profile and, instead of controllable LEDs as on the H100i, features an interchangeable ring. This allows you to swap the standard grey one out for a red or blue one to better match your set-up. 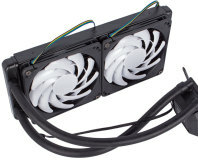 It would have been even better to see multiple SKUs of the H105 where the fans are coloured too, but equally this would result in a higher price and the fans are likely to be installed in a relatively discrete location. Still, we can't help feel the all-in-one cooler market could do with a splash of colour. 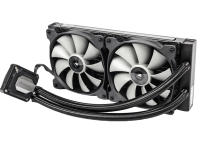 The tubing on the H105 is of the thick and sturdy rubber variety, which is still nice and flexible and that we much prefer to the older, thin plastic type. 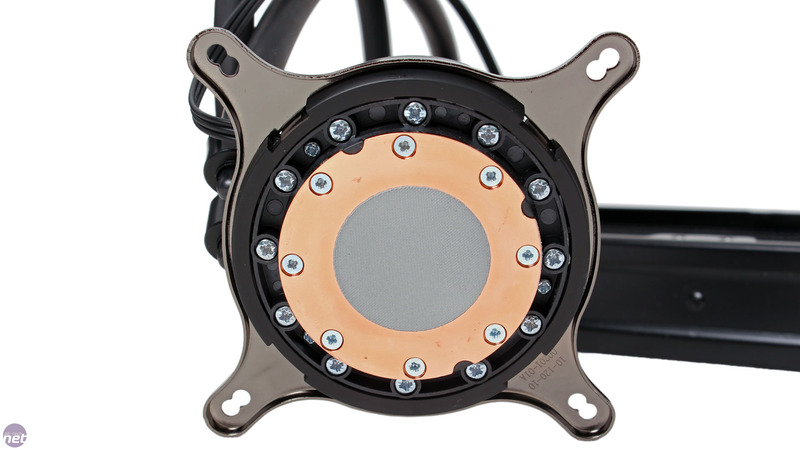 The copper baseplate comes with a thin helping of thermal paste pre-applied (no extra is supplied, however) and with the Intel mounting bracket already installed, thus saving you a couple of jobs (but perhaps being a little annoying if you're using an AMD chip). 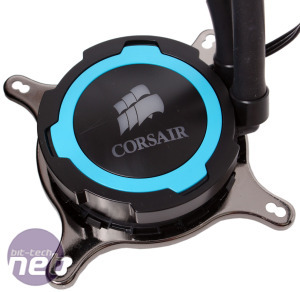 Corsair still utilises a plastic backplate over a metal one, though it's easily sturdy enough to take the small weight of the pump unit. 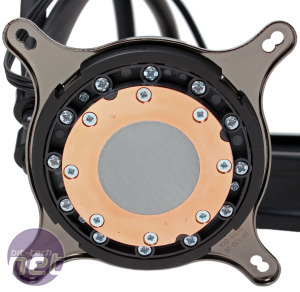 The backplate also comes with pre-installed nuts on, which you can easily adjust to suit your socket. The remaining installation of the pump is very simple and quick and requires no tools – you may want to use a Philips screwdriver to tighten up the final four nuts, however. 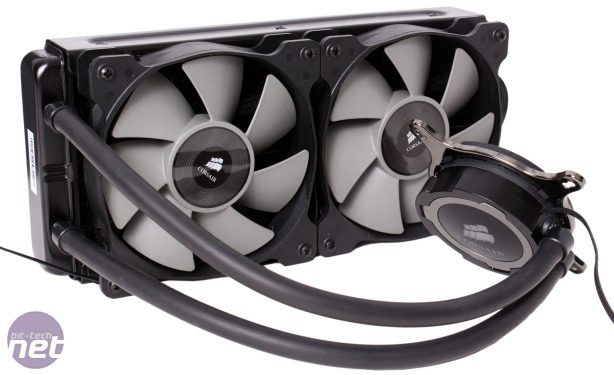 Something you will have to watch out for is the thick radiator – you'll need at least 63mm of clearance (or about 90mm with a second set of fans). 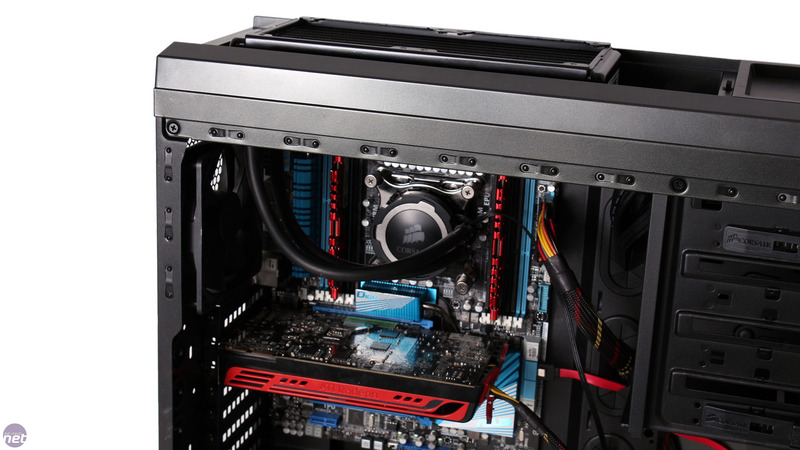 Even in our Carbide 500R, we were unable to fit both the radiator and fans beneath the roof mount without interference from our motherboard. 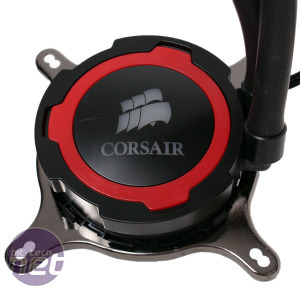 It's worth noting that Corsair recommends installing the fans as intakes, but for consistency we test all coolers like this with the fans blowing as exhausts from beneath the radiator. We therefore installed the radiator in the upper roof compartment, which left us unable to properly attach the mesh panel.